Earlier this week, two Dota 2 players from the Philippines, Carlo “Kuku” Palad and Andrei “Skem” Ong were embroiled in controversy after using a slur term, targetted at Chinese people, in their matches. Post these incidents, Skem was reprimanded, and fined by coL management almost immediately. He later posted an apology on his Twitter account. However, Kuku got himself involved in more controversies by purporting false statements in Weibo, after posting an apology on his personal Facebook account. Following these incidents, the Chinese Dota 2 community has been urging Valve to take some action against the two players who have made these comments. Reddit user yyhfhbw made a post on /r/DotA2 detailing the community's uproar. "So nowadays everybody thinks its OK to say that to Chinese teams? Who the f**k do you think you are??? 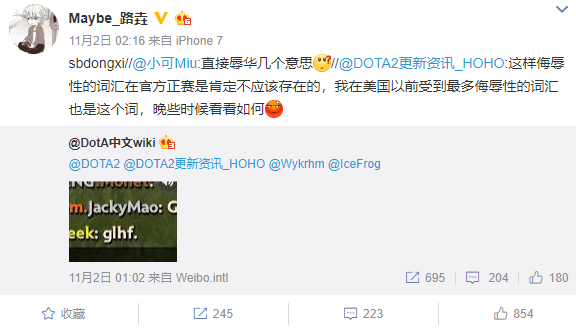 I'm so done"
Shortly after, Lu "Somnus丶M" Yao simply wrote: "sbdongxi" on his weibo which translates to "f**king piece of s**t"
“Recently, two racist incidents against China happened, one from team coL in a Minor match and the other from team TNC in a pub game. Multiple parties have reported these. Unfortunately, no reaction has been made from Valve's end. We are very disappointed with how things end up and Valve's neglectful attitude! Vici Gaming also issued a statement on this matter. In the meanwhile, the Dota 2 Review page on Steam has been bombarded with negative reviews from steam users.